Tundra Games has opened up shop with its debut title, Rapture – World Conquest (Free). With a new faceplate and some veteran talent, this game studio is one to keep an eye out for. If you asked the question: how could you make the Civ experience accessible and time-appropriate for the iOS mobile platform? This game would probably be the answer. 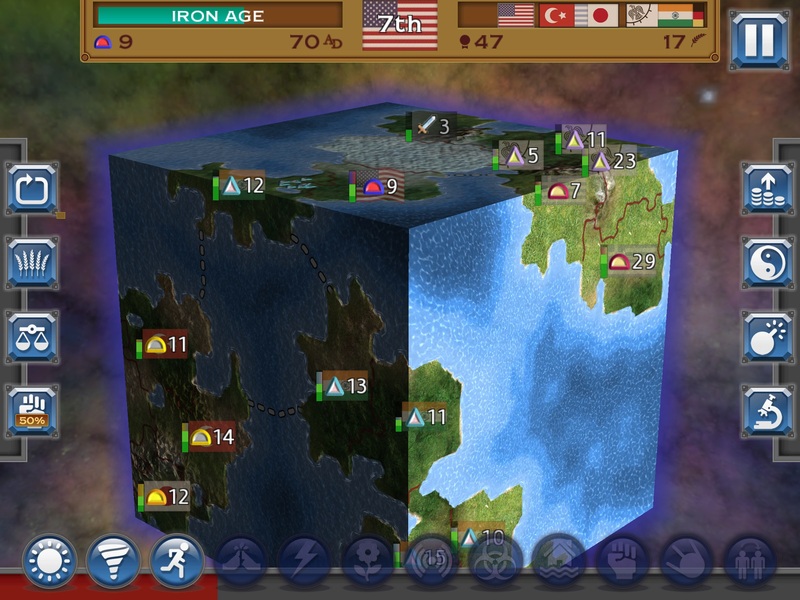 Sure there are plenty of world conquering strategy games out there, but this one has a fantastically frenetic pace that is perfect for on-the-go gaming. Rapture is a paid app. It has IAP. It is a great game. I bet some of your brains just exploded. I bet some of you aren’t even reading and frantically typing a comment about how I/IAP/VIDYA GAEMS am/are horrible and irredeemable. For those of you still with me, you are in for a treat. Rapture has a very simple and intuitive interface and still manages to retain strategic decision making. The default difficulty can usually be defeated with a simple zerg technique that brings my back to my days of sitting in front of a Risk board. The game plays a lot faster than Risk ($6.99), and at higher difficulties requires more strategy too. I consider the IAP a big ‘Thank you’ button for the developer. If you don’t want to press it, there is no pressure to do so. Through the course of normal play, I have not felt hampered or encroached upon in any way by the existence of the IAP. While it is true there are some quests that require you make purchases in the store, I have yet to get one that I couldn’t afford with the currency I earned having played a few games. If this were ever to turn into a multiplayer game, there is no gameplay advantage that you could attain from it either. The IAP is handled very well in Rapture, and is a great model for developers considering including it in their own games. I really love the gameplay of Rapture. 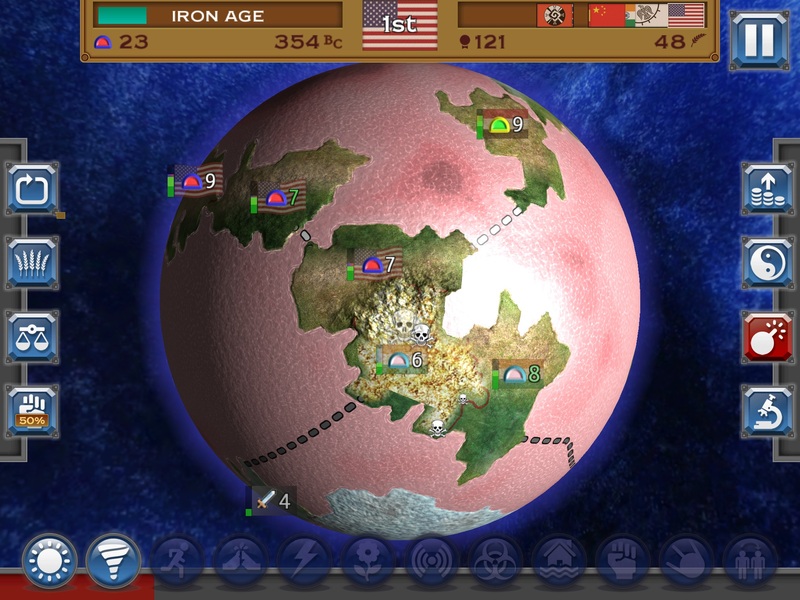 The whole point of the game is to grow your armies and eradicate other nations. As I mentioned earlier, each game is fast. Within the time span of a few minutes you will be able to determine the fate of a planet. Combat is quick and simple. In general it is a numbers game where you simply send more armies at a country than there are occupying it in order to capture, but there are a number of buff, debuff and damage spells that can tip the balance in your favor. In addition to spell choices, there are also 4 categories that you can choose to focus on to get temporary boosts. You can focus on population growth, mana for spells, combat ability, and technological research to advance to the next epoch faster. The downside is that focusing on any of these means that the other 3 suffer. It’s not what you would call an involved structure, but just enough to make a difference when you choose to focus on the right thing at the right time. Just like in Risk, the real thrill of the game comes for me when you start steam rolling enemies. Watching a nice big horde of armies swarm over a continent is pretty awesome, and I have to admit I am often tempted to give up any semblance of strategy and go full ham just to see how fast I can wipe out a region. After a few games you’ll have enough currency to go shopping in the store. There are a really large amount of unlockable options including which nation you play as, sea color, atmosphere color and background color. You can even unlock Earth. The real standout in the shop is the different planet shapes, each one gives a very unique feel and enhances replayability by quite a bit. The planets with hard edges are a little tougher to navigate, but not unplayably so. Even though there are quests that require you make specific purchases, you’ll still have plenty of credits to pick up unlockables even without grabbing any of the IAP. There is only one feature that I really really wish had been included in Rapture. Multiplayer would really take this game into the ‘would never leave my iPad’ zone. While unlockables do enhance replayability, they still pale in comparison to how great it would be to play against other human beings. Normally I don’t isolate a single feature and harp on it, but it really seems to be set up to be a an amazing multiplayer game… that just happens to not have multiplayer. I can hope that in future updates or maybe even future games Tundra brings it out, but until then Rapture is still a fantastic pick worthy of your money.